If you would like to support me and the writing I do, please purchase my book Managing with Aloha for yourself, or as a gift for those you feel have the calling of Alaka‘i Managers and would like to learn more. Continue reading for a Publisher’s Synopsis of each title, or see them all on a single buy page at either Amazon.com or Smashwords. The Smashwords links give you choices for e-readers, computers, and mobile devices, and include a PDF option for printing. … is the book which will share my both my story and my mission with you, and it is definitely the book to start with. It was written as a manager’s story, and designed to be a manager’s ongoing write-in resource — yours. The ebooks I now write are the more detailed how-to files of the Managing with Aloha filing cabinet. MWA is offered in hardcover and on Kindle. Managing with Aloha is also the best framework you can have in continuing to read this blog, for Talking Story started as “the blog of Managing with Aloha” — and it still is: Learning Managing with Aloha: 9 Key Concepts. “Values” may be the most frequently spoken word in business today. Yet Rosa Say, founder of Say Leadership Coaching and former Vice President of Hualalai at historic Ka‘Ã»pÃ»lehu, boldly proposes that Hawaii is optimally suited to lead the world in the pursuit of values-centered business, because we all live with something good and right by its very nature: Aloha and all it embraces. Managing with Aloha explores nineteen different Hawaiian values, and in the tradition of Dr. George Kanahele this book demonstrates how managers can bring these universal values into every kind of business practice today. Say draws on many examples of how she put these values into profitable practice in her own successful career as a manager, and she eloquently shares her common-sense approaches to blending the social and economic goals of business enterprise in ways that define a Hawaiian sensibility for the way we work and live. Buy Managing with Aloha in hardcover, or in the Kindle Store. Alaka‘i is the Hawaiian value of leadership. This free ebook is the how-to guide for Managing with Aloha, Bringing Hawaii’s Universal Values to the Art of Business. Written by the book’s author, workplace Aloha coach Rosa Say, this is much more than a conventional reading guide, presenting a comprehensive 5-step self-coaching program for managers learning to bring Alohato our workplaces. Read the story behind the book: Ready? Become an Alaka‘i Manager in 5 Weeks! … was published in May of 2010 as an ebook, and for a broader audience. I am very passionate about how having a business mindset can help everyone today, and not just managers: In our current economic climate, business thinking is a survival skill. Purchase on Kindle, or via Smashwords. …is my newest ebook, published in January of 2011 as a direct result of the conversations we have here on Talking Story. It covers value alignment in greater detail (Key 3 in Managing with Aloha) and describes the how-to of value mapping. Purchase on Kindle, or via Smashwords. 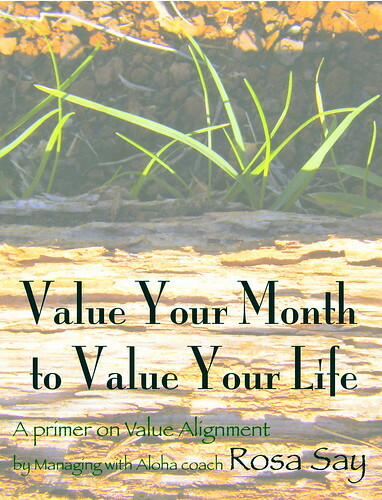 Value Your Month to Value Your Life presents a self-coaching process aimed at value alignment: We call it value-mapping in the Managing with Aloha sensibility for worthwhile work. Value mapping strengthens you. You can practice it immediately to improve the daily quality of your life, boosting your confidence by building better values-based habits. Value mapping is a way that good begets good, beginning with the good which already resides within you in the form of your personal values. To illustrate, we’ll cover two workplace how-to’s: The Value of the Month program, and Value Steering for Projects, both which help foster healthy business cultures. I spent some time digging into Rosa Say’s Managing With Aloha this weekend and I was struck by the fact that her book covers a lot of ground important to managers and leaders. Her examples are very relational in one section and tough in the next. That’s the way business really is. Most books favor one list of words over the other, but Rosa explores areas represented in both sets of words. Managing with Aloha is practical and inspiring. Rosa offers examples for how to manage in very real situations like selecting people and providing performance evaluations. She also heads up to the 50,000 foot level to make sure her readers know what’s most important. Managing with Aloha is an interesting book and more valuable and practical than most. Rosa is a deep and soulful leader and she is also tough as nails – a perfect combination in business I think! Whether you view your business as an arena or a sanctuary reveals a lot about your leadership style and corporate culture. I am of the view that a business should be a sanctuary. Where people can find refuge and safety. That love, encouragement, and oneness are valued and practiced. To learn more about how you could make this transition you only need to look to leaders like Rosa Say… Rosa’s book, Managing with Aloha: Bringing Hawaii’s Universal Values to the Art of Business spells out how managers and business owners can apply Hawaiian values to their life and business. Rosa’s approach is based on 19 specific values found in Hawaiian culture. I found Managing with Aloha to be a rich, engaging, and soulful read. I sensed a real connection with the author, earth, and myself. Several months ago I had the pleasure of reading Rosa Say’s signature work Managing with Aloha. If you find yourself in a new context as a manager or you are discovering that older methods of managing are just not helping you glean the best from your staff (or retain them), this book is a must. At about 230 pages, Managing with Aloha is one of the “easier” reads you’ll come across in regards to management. This is largely due to Rosa’s fluid style and knack for story-telling. If you’re like me, you would rather read 10 pages of “this is how the principle worked with real people in the real world” than 20 pages of statistical analysis and abstract reasoning that “proves” the principle. This book brought a breath of fresh air to my business and management reading list. It offers a compelling new lens through which to bring practices to light that enrich one’s personal and professional work. Business Thinking with Aloha is one of those books I think I’ll never truly ‘finish’ with, but continue to savor and periodically return to. Read more Reviews on Amazon.com and please think about adding one of your own!